As part of our summer activities I have started to work through the alphabet with my children and a few friends. We have been doing 2 or 3 things per letter (on different days). Sometimes it is a craft, sometimes it is a food thing and sometimes it is something entertaining to do. So far, we have been having a lot of fun with it. For the letter B we made Bead Bracelets with pipe cleaners. It ended up being a lot of fun and they were all so proud of their final project. Because we used pipe cleaners, even the 2.5 year olds were able to do it on their own with a little help to start out. Best part of this project is that it was pretty cheap. A little bag of 500 beads cost me less than $2 and I almost have a whole bag left! I think we will have to do this again soon, since this is my daughter favorite piece of jewelry and she has been wearing it every day since we made them! It’s pretty simple to figure out what to do. 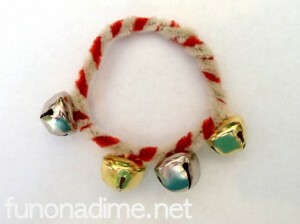 You just need to prevent the beads from falling off the bottom end by creating a swirl or knot with the pipe cleaner. And then let the children slide the beads on. I helped the 2 year olds put a couple on and they pretty much had it figured out from there. If you use yarn, be sure to tape the end they will be using to slide on the beads. It will keep it from fraying. For little wrists wrap the extra pipe cleaner around their wrist and then wrap each end around the section of bracelet it is near (see top picture). This will keep it the size you want and keep the beads from falling off. **Make sure to leave the bracelet big enough to take on and off their wrist easily AND make sure to pinch in the very ends of the pipe cleaner when finished. They tend to pinch and scratch skin if not tucked away properly. Make an animal or a crown instead of a bracelet. My son combined a few pipe cleaners to make his own version of an animal (see above picture). If you do not have any beads use a Fruit Loop/Cheerios type cereal or make some colored noodles and use those to create something. Such a great idea for fun and learning! As always – great craft idea!! What a great project – your blog is always such an inspiration for kid friendly projects! I am going to pick up the stuff to do this with the kids on my 7 off! My kids loved stringing beads when they were young. We had more necklaces and bracelets than we knew what to do with! Thanks for sharing. I'm visiting with life in the pitts, hope you visit me too! I bet they loved that! That's a wonderful way to learn "B". This is a favorite activity in our house! I'm starting a new sew along, come check it out at TheTrainToCrazy.com! Aww, what a great project! What a great idea to use pipe cleaners for preschoolers! Well done.